In the design of any new high explosive ammunition, the most complex and often problematic component is the fuzing system. The fuze must incorporate a Safe and Arm device to ensure that the projectile may only enter the armed state following exposure to firing forces and after reaching a safe distance from the muzzle of the weapon. Engineers at System Design Evaluation Ltd. (SDE) in Hertfordshire, UK have constructed rigid and flexible body MSC Adams models to study the motion and strength of the design of fuze mechanisms to identify potential design issues and assist with analysis of trials results. 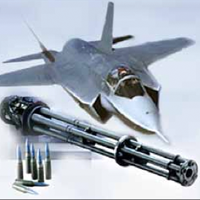 The Nammo 25mm APEX projectile is a next generation armour-piercing, high-explosive ammunition designed for use with the US F-35 Joint Strike Fighter aircraft. The projectile leaves the muzzle of the 4-barrelled GAU-12 weapon system with a velocity of around 1,000m/s and experiences a peak setback acceleration of almost 80,000g. Under these conditions, coupled with severe space restrictions, it is almost impossible to instrument the fuze in order to gain an understanding of the operation and interaction of components inside. Therefore, while physical testing can be used to confirm functionality of the fuze, it often offers only limited information for post analysis in the event of a failure to function. Adams modeling has proven invaluable in providing information to assist with the diagnosis of evidence gained from recovery tests. In one case, examination of the internal components of the fuze after recovery tests showed markings which indicated a malfunction had occurred. A detailed flexible body Adams model of the design was developed, and analysis confirmed the nature of the problem and sequence of events within the fuze mechanism; huge centrifugal forces due to projectile spin resulting in deformation of internal components sufficient to result in the unlocking of two retaining gears. Computer modeling of ammunition fuzes has not been without challenges. Safe and Arm devices are often mechanical and operate using clockwork escapement mechanisms, similar to those found in wrist watches. Such mechanisms rely heavily on 3D contact, leading to extended run times. Further, fuze arming times are largely dependent on the definition of frictional algorithms within the models. SDE has worked closely with fuze manufacturers to overcome this and validate models against static spin tests thereby providing a firm basis from which to investigate further design permutations. The Adams results have not only successfully predicted the failure of components on numerous occasions within various fuze designs, but have also facilitated in the redesign of components to achieve suitable strength. Importantly, by quantification of stresses within components, Adams has assisted in proving compliance with required safety factors, information which is not possible to glean from live firing trials results.